What’s better than the smell of freshly baked, homemade cookies? Eating them! So, get out a bowl and cookie sheets while you browse through this collection of delicious and simple cookies. Whether you’re in the mood for a drop cookie, refrigerator cookie, bar cookie or no-bake cookie, you’re sure to find the perfect treat for after school snacks, late night munching or gifts for family and friends. 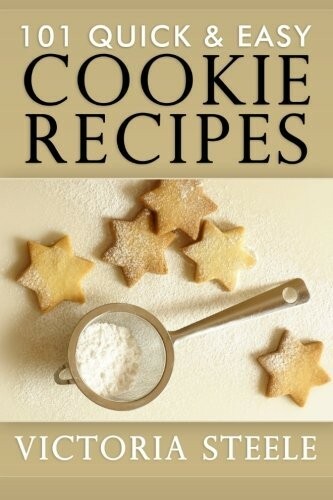 With over 100 cookie recipes, you’ll never be short on ideas for your next cookie baking adventure. These recipes are all made with the ingredients you probably already have on hand, and are simple and fast from start to finish. You and the family will be enjoying a sweet treat in no time, and the simple recipes make cleanup a snap. Make traditional favorites like Peanut Butter Cookies or Chocolate Chip cookies, or try something new like Cashew Cookies or Coconut Baboon Cookies. You’ll also find simple recipes your kids can make themselves, like no-bake Chow Mein Cookies and Almond Bark Cookies. These are great for Saturday night sleep-overs and slumber parties. So, take out your apron, put on your favorite music, pick out your favorite recipe and start baking a sweet treat the entire family will enjoy.